RUGBY UNION: A SATISFIED Dai Young was happy to come away from Exeter with three points following a thrilling 35-35 draw at Sandy Park which saw Wasps extend their lead at the top of the Premiership table by five points. Despite being reduced to 14-men after Jonny Hill was red-carded, Exeter showed no signs letting it effect them and the home side played their part in what was a pulsating game of rugby with the scoreline switching throughout. “Maybe we should have won against 14, but they had the wind at their backs and they kept things a bit tighter after the red card,” said Young. “There was lots of good stuff from us and also lots of not-such-good stuff. We had opportunities we didn’t take, but in saying that I’m far from disappointed with three points at Exeter. 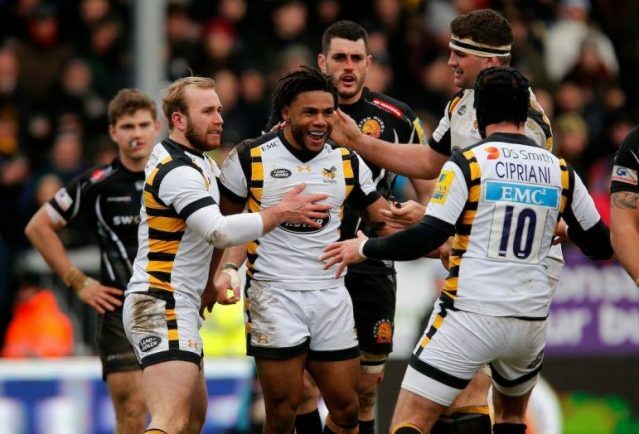 Wasps went ahead in the fifth minute thanks to Christian Wade’s tenth try of the Premiership campaign, which was easily converted by Jimmy Gopperth, but Exeter hit back immediately with Sam Simmonds crossing after Danny Cipriani’s clearance kick was charged down and Gareth Steenson scored the conversion. Mitch Lees was then sent to the sin bin for a breakdown offence and Wasps were awarded a penalty try which Gopperth converted again for a 14-17 lead. Fifteen minutes before halftime, Exeter drew level again after Jack Maunder crashed over the line near the post following some good play by Phil Dollman and the conversion was a formality for Steenson. But Wasps got their noses in front again just moments later. Alex Rieder this time crossed the white line and Gopperth’s conversion gave the visitors a seven point lead. Wasps felt a double blow at the end of the half with the referee awarding the second penalty try of the game to Exeter, which Steenson converted to level the score and Thomas Young was shown a yellow card as the first half ended 21-21. The hosts made the most of their one man advantage and Luke Cowan-Dicke soon crossed to secure Exeter a bonus point three minutes after the break, with Steenson adding the extra points. A turning point came directly from the re-start. Jonny Hill was shown a red card for a high tackle on Ashley Johnson and seconds later Cipriani sent Kyle Eastmond over between the posts for a try which was converted by Gopperth. WIthin three minutes, Exeter were back in front when Olly Woodbrun was allowed to race through for a converted try, but with 11 minutes to go they went up the other end to score one of the tries of the season. Cipriani’s pace created the space to send Frank Halai over halfway. He found Joe Simpson on his inside, and the replacement scrumhalf stepped inside, before driving through a last-ditch tackle to go over. Gopperth’s conversion levelled the scores yet again and it remained 35-35 at the final whistle. Young added: “We could have won, but we could also quite easily have lost as both teams squandered opportunities. It was a great game for the neutral, but not so great for us coaches as we were pulling our hair out on occasions.